Uttpatti Ekadashi is the Hindi word for "eleventh." Hindus observe 24 11th-day fasts during the course of the Hindu year, although some are more important than others. Each Ekadashi is held in honor of a different Hindu legend and has specific religious duties associated with it. Eating rice, however, is prohibited on all Ekadashi. Uttpatti Ekadashi falls in the month of Margashirsh as per the traditional North Indian Hindu calendar. This usually occurs during the waning phase of the moon (Krishna Paksha). As per the Gregorian calendar, the date occurs somewhere in the month of November or December. All Hindu devotees who plan to start with the Ekadashi vrats, Uttpatti Ekadashi, also known as Utpanna Ekadashi, serves as the best vrat to begin off with. Observance of this vrat is related with washing all the sins committed during the previous and present births, thereby leading to the attainment of Moksha, or salvation. Find out about the story of Uttpatti Ekadashi and how to observe it in the following lines. Uttpatti Ekadashi is associated with Lord Vishnu demolishing demon Murasura. Also, the birth of Ekadashi Mata takes place on this day. Lord Vishnu was observing his sleep. Meanwhile, demon Mura thought of killing the Lord and taking over him. To overcome this situation, Goddess Ekadashi was born through divine creation who then killed the demon. Lord Vishnu was highly grateful to the Goddess and thanked her for her immense courage and devotion towards the Lord. Furthermore, he even blessed her and informed that anyone observing this Ekadashi would be blessed with salvation. Since then, most Hindu devotees observe a fast on Uttpatti Ekadashi in order to attain liberation. While in North India, Uttpatti Ekadashi falls in the month of Margashirsh, it occurs in the Kartik month according to the Andhra Pradesh, Maharashtra, Karnataka and Gujarat calendars. In the Tamil calendar, the month is Aippasi or Karthigai Masam while it is Thulam or Vrischika Masam in the Malayalam calendar. 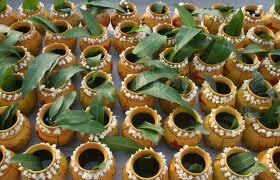 Furthermore, this Ekadashi falls in the month of Margashar in the Orissa calendar. All devotees practicing this fast start their vrat from sunrise on the Ekadashi day and break it only on the next day, that is, Dwadashi day. Along with Lord Vishnu, Ekadashi Mata is also worshipped on this day.